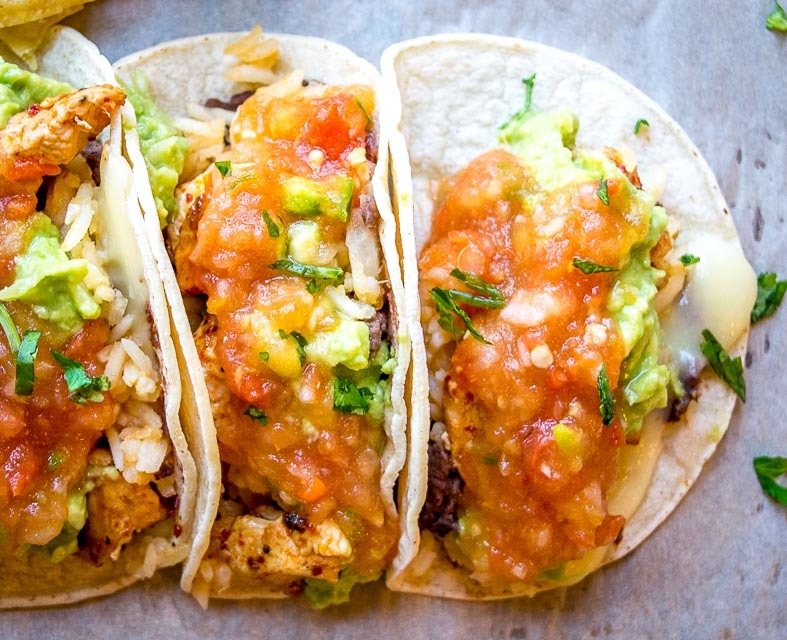 These Chicken Tacos are not afraid to put themselves in the running for top taco. Of course, it’s worth noting who is making that claim. In this case, it’s someone (uhmmm…me) who has eaten various incarnations of these chicken tacos at least a couple hundred times over the past few years. But it’s not because the recipe is top secret or anything like that. Rather, it’s collecting all the home-cooked elements onto a single table that makes these tacos so rewarding. Most likely they’ll be quite different than the tacos you grew up with, and that’s a good thing! Finding a substantial upgrade to such a common meal is a real treat. And the good news is that you don’t have to worry about re-creating each element teaspoon perfect. Just get everything on the table and have at it. Trust me it is worth it. I’ll be the first to admit that I occasionally take shortcuts on these tacos and they still come out delish. However, there is one element on the menu that I would consider non-negotiable and that is the salsa. Freshly made salsa is the hidden driver of these tacos so I highly recommend making it from scratch. Your family/friends will be forever grateful! 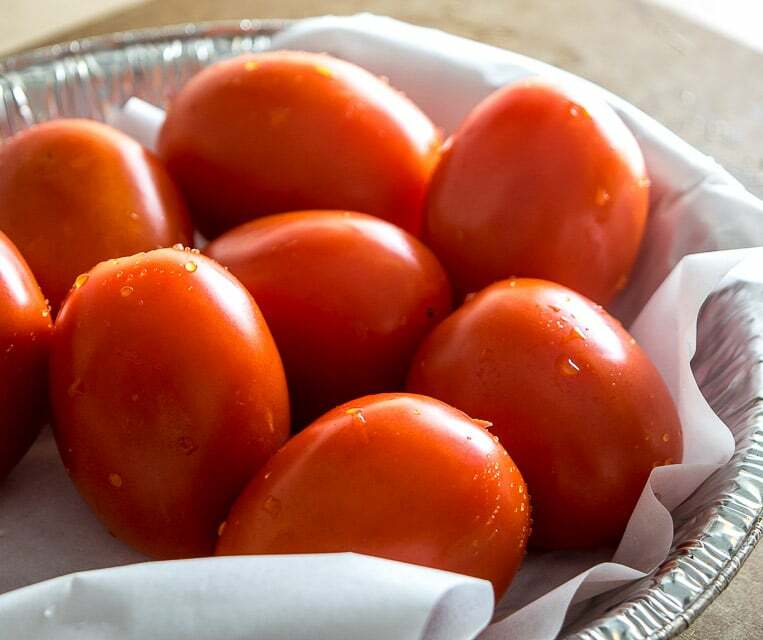 Start by roasting 7-8 plum tomatoes in a 400F oven. You’ll need six of them for the salsa and 1-2 of them for the rice, dependent on their size. They’ll need about 20-25 minutes to roast in the oven. 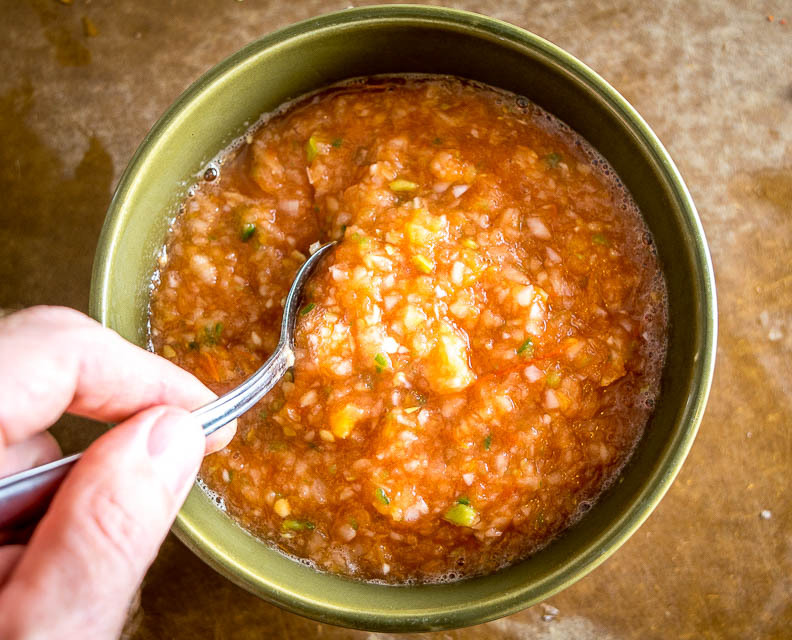 This is essentially a double batch of our Tomato Jalapeno Salsa so you can always check here for more details on it, but I’ll list out all the key details in this post as well. As the tomatoes roast you’ve got plenty of time to get started on the other elements. 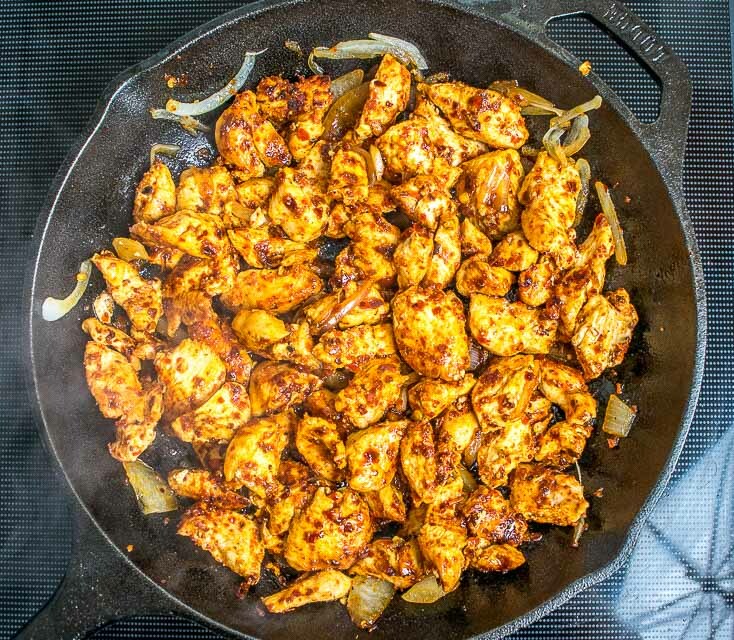 Chop up two chicken breasts into bite-sized pieces and give them a good swirl in the seasoning bowl. Set aside until you need it. 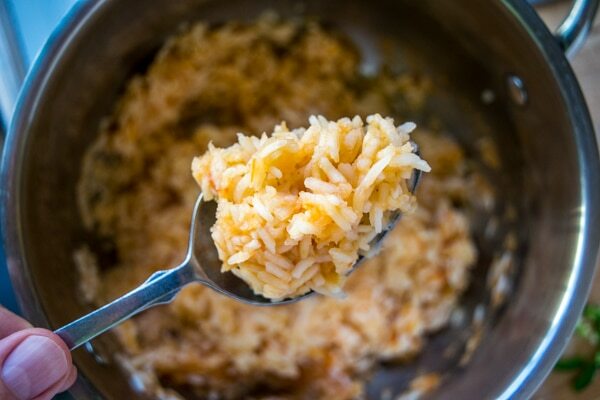 The rice is a very simple Mexican Rice. You’ll need a couple tomatoes that are roasting in the oven so I usually start the rice about halfway through the roasting period and snag the tomatoes from the oven before they are officially “done”. Heat a glug of oil in a saucepan over medium-high heat. Add 1 cup of rice. Cook for a few minutes, stirring occasionally, until the rice is turning opaque and light brown. Add one of the roasted tomatoes to a blender along with 1/2 onion and a single garlic clove. (You can use two tomatoes if they are smaller.) 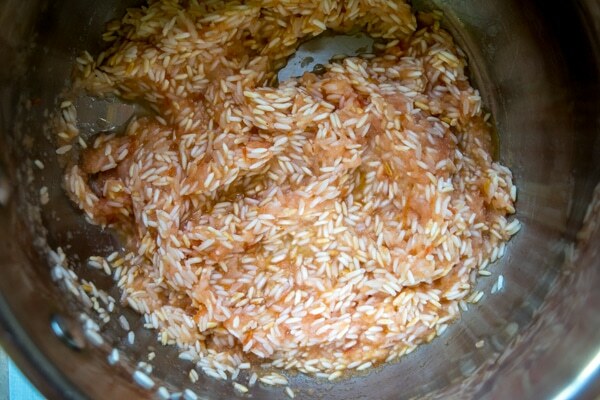 Combine well and add to the saucepan, letting the puree cook into the rice for a few minutes. Add 2 cups of stock (I use this chicken stock) and 1/2 teaspoon salt. Stir well and bring to a boil. Reduce heat and let simmer until the liquid is absorbed, somewhere around 10-15 minutes. 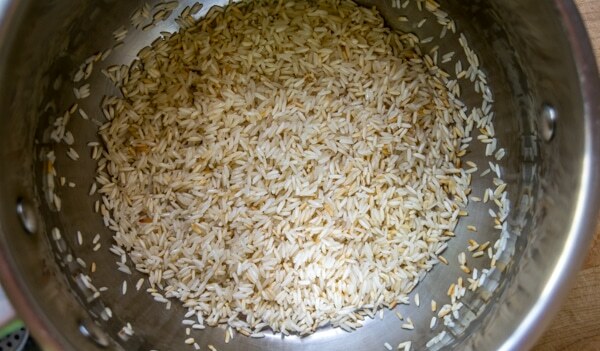 Once the liquid is absorbed set aside and cover, letting the rice sit in its own steam for a few minutes. And definitely salt to taste. I added another pinch to this batch. For the chicken, I usually start by cooking 3-4 tablespoons of onion in a glug of oil over mediumish heat. 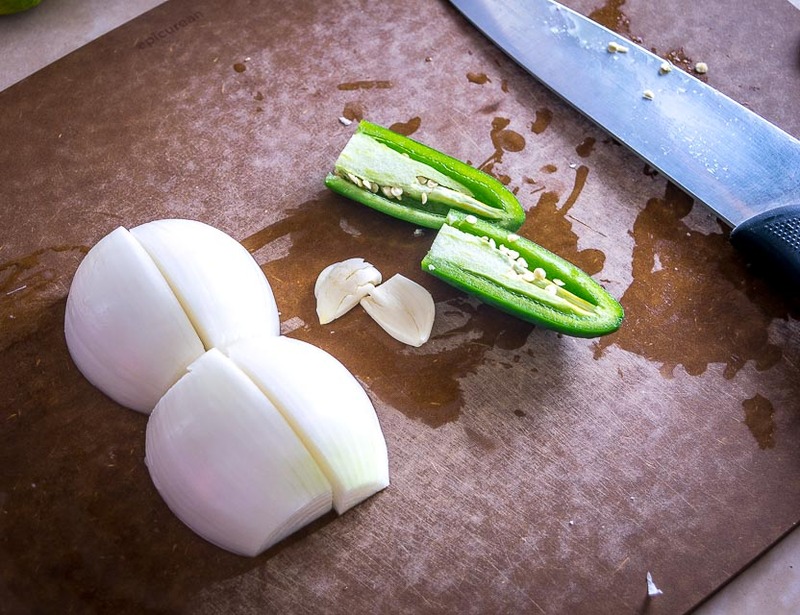 Once the onion is tender add the chicken and form a single layer as much as possible. Let the first side cook all the way through and then give it a flip, briefly cooking the second side. Don’t eat it yet! Put the cooked chicken in a serving bowl and cover with foil. I usually start the guacamole when the chicken goes in the pan as you only need a few minutes to make it. We’re using our Basic Guacamole recipe for these tacos and it’s the perfect fit because of its simplicity. You don’t need tons of extra flavor in the guac because you’ll be getting so much flavor from the salsa. In a bowl, combine 1/2 teaspoon of salt, 2-3 tablespoons of chopped onion, and the juice of a single lime. (I usually crush the onion with the back of a fork to mimic a molcajete and release some additional oils.) Add the flesh of two ripe avocados and combine well. Salting to taste is crucial here. I added another pinch of salt and cut open a second lime for another squeeze. 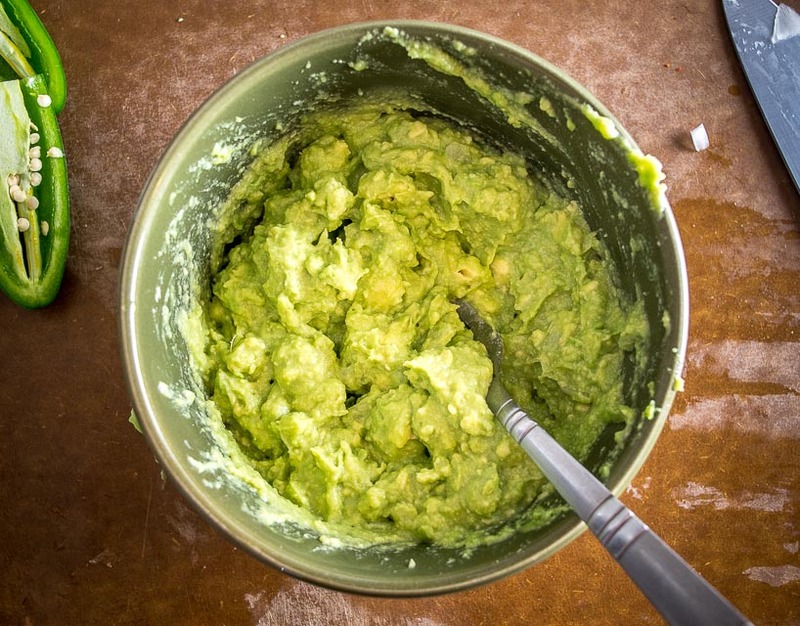 You’ll end up with an awesome batch of guacamole that comes with the potential to be your new default guac recipe. Add to a blender or food processor along with the tomatoes and give it a pulse blend. No need to blend it all the way as it prefers to be left a little chunky. Yum! Sometimes this salsa is perfect even without the salt so feel free to omit it. It’s also worth tasting it for heat (capsaicin) level; you can always add more jalapeno for a more fiery version. I usually take that shortcut with these tacos as you don’t need much flavor from the beans. 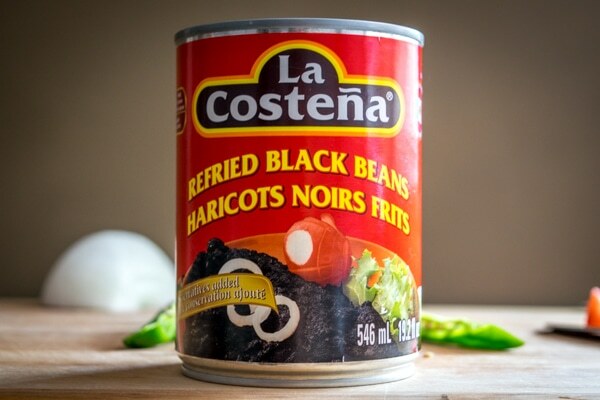 Of course, if you want to make a fresh batch of refried beans there is some good info on that here. In addition to the homemade salsa, there is one other non-negotiable aspect of this recipe. Serving up the chicken tacos hot and crispy makes them taste infinitely better, so I highly recommend trying that the first time you make them. Sure, you can put a pile of corn tortillas on the table and let people build their own, but I think they are so much better if you crisp up the tortilla and melt the cheese before serving. In other words, you’re building the first half of the tacos with beans, rice and cheese, and letting your peeps build the rest of the tacos themselves. 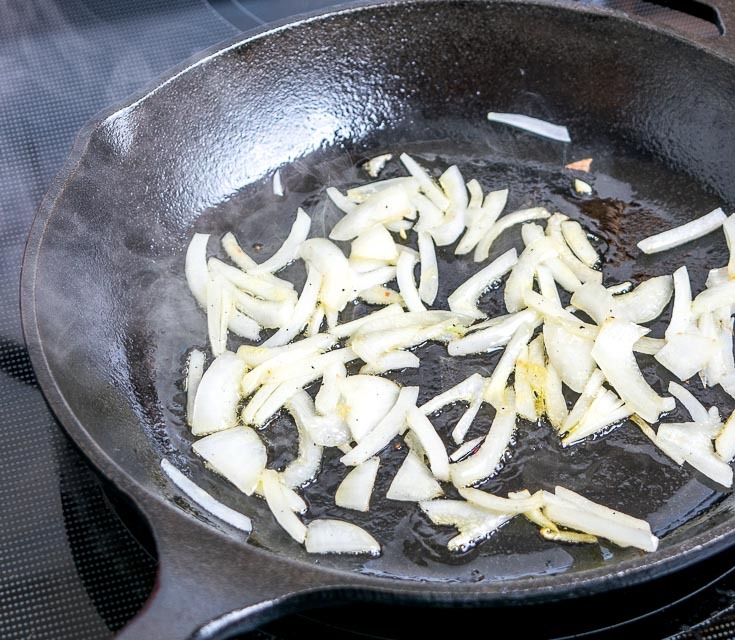 Heat up a skillet or comal to mediumish heat. Add four corn tortillas (or as many as you can fit) and give each of them a layer of beans, cheese and rice. Let these cook for 1-2 minutes or until the cheese is melted and the bottom of the tortilla is starting to turn golden brown. Keep in mind that people will fold them as they eat them so you only need to cover half of the tortilla with the beans and rice. As these cook, make sure the other elements are ready to go on the table: chicken, guacamole, and salsa. Then it’s time to chow down! Don’t forget to loudly recommend a goopy, over-the-top serving of salsa in each taco. When these piping hot crispy tacos are drenched in a freshly made salsa then at least for a few minutes all is well in the world. Yes, you’ll have to head back to the stove to crisp up a few more batches, but I think this step is totally worth it. I do it 100pct of the time because it creates a rich flavor that most people have never had before. And there you have it. Chicken tacos that you might make a couple hundred times over the next few years. And don’t forget that they are super forgiving. There are times when I’ve made these tacos for family/friends with all of the elements made from scratch, including the tortillas and refried beans. There are also times when I’ve taken substantial shortcuts like using leftover rice and canned beans. And I always get the same reaction, i.e. beaming peeps and happy stomachs. So please remember that you’ve got some leeway on the elements; the important thing is to get them on the table and let your family and friends go wild combining them all. Feel free to ask any questions in the comments section below or you can always send me an email. I know, World's Best is a big claim, but these chicken tacos are the ones I always come back to. The home cooked Salsa is the key so please don't skimp on that step. So good! Start by rinsing and stemming 7-8 plum tomatoes. Roast them in a 400F oven for 20-25 minutes. 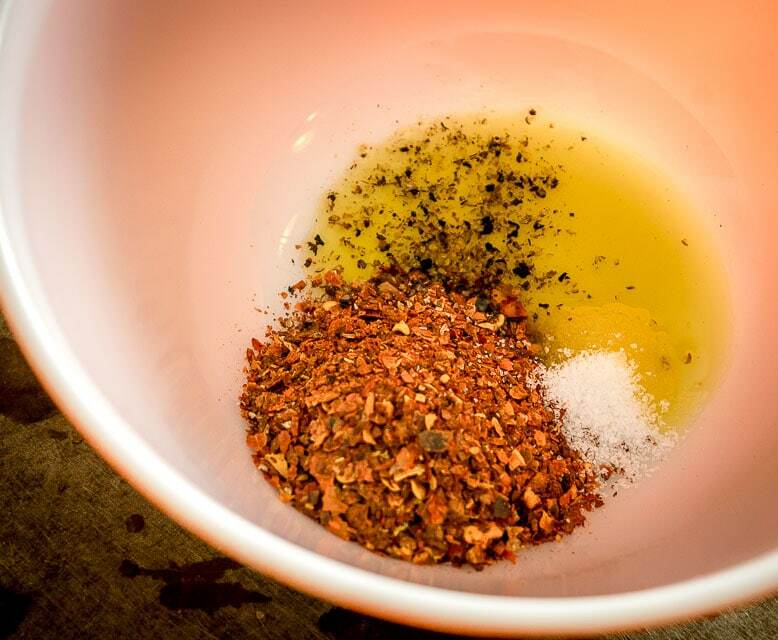 For the chicken, add the seasoning ingredients to a bowl: 2 tablespoons crushed New Mexican chile (optional), 1/2 teaspoon salt, freshly cracked black pepper, and a dollop of oil. Chop up two chicken breasts into bite-sized pieces and combine well with the seasoning. When the tomatoes are done roasting add six of them to a blender for the Salsa along with 1 onion, 2 garlic cloves, 1 jalapeno, and a pinch of salt (optional). Pulse blend, leaving it a bit chunky. Taste for seasoning and for heat level. You can always add more jalapeno if you want a more fiery Salsa. To cook the chicken, I usually saute 3-4 tablespoons of chopped onion in some oil until tender (over medium-high heat) and then add the seasoned chicken. Form a single layer as much as possible and let the first side cook through all the way, then flipping and briefly cooking the second side. When done, add the chicken to a bowl and cover with foil until serving. I recommend half-assembling the tacos for your family and friends, i.e. crisping them up on a comal or skillet before serving. First, put the chicken, guacamole, and salsa on the table in serving bowls. Then add 4-5 corn tortillas to the comal or skillet over mediumish heat (or as many as you can fit). Add a layer of refried beans, cheese, and rice to each tortilla. Cook until the cheese is melted or the bottom of the tortilla is turning golden brown, approx. 1-2 minutes. Serve immediately and let your peeps add the chicken, guacamole, and salsa themselves. Half-assembling the tacos before serving, i.e. crisping them up in a comal or skillet, means that you'll have to go back to the stove throughout the meal but I think this is totally worth it. 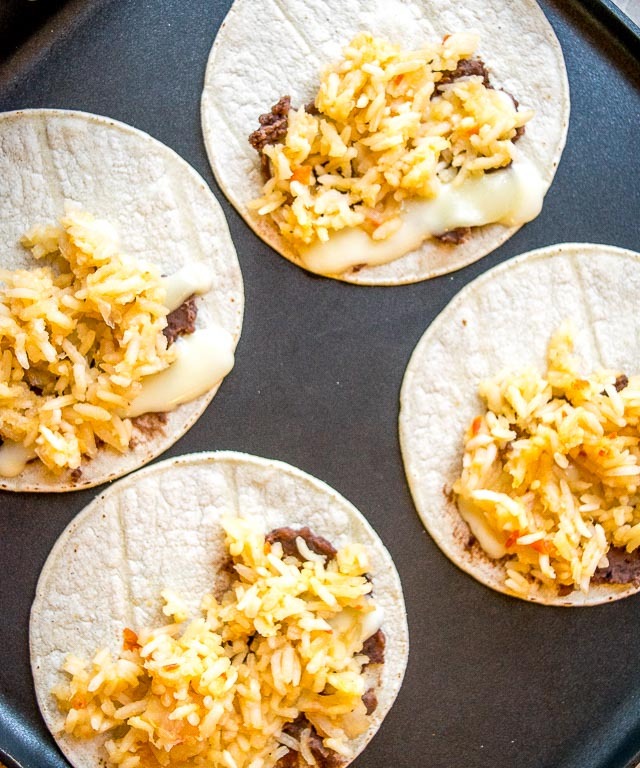 A piping hot, crispy tortilla with melted cheese makes these tacos absolutely delicious. 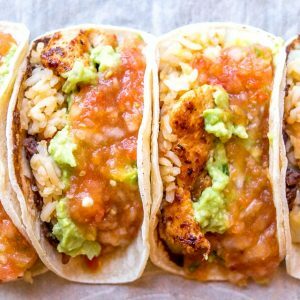 Since people will be folding the tacos as they eat them, it's best to add the beans-cheese-rice layer to only half of the tortilla. 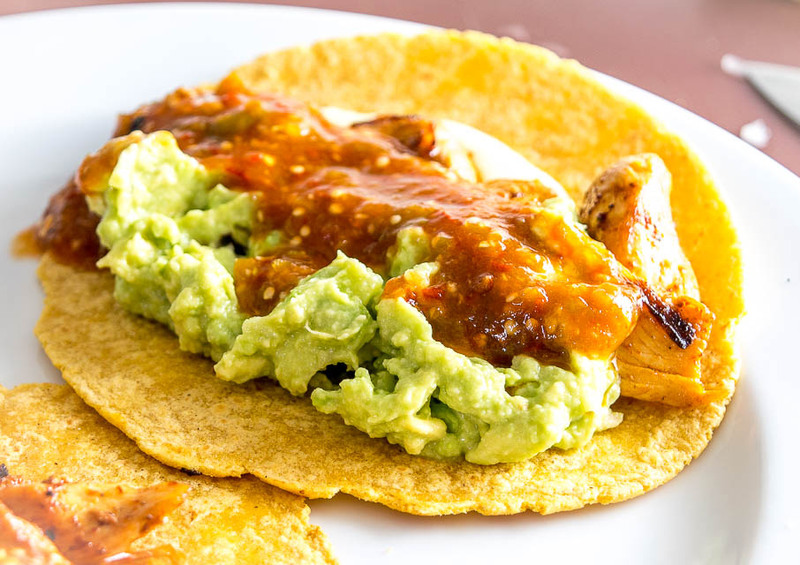 If time has passed and the chicken sitting on the table is getting cold, you can heat it up by adding pieces of it to the tortillas you are crisping up on the stove. Sometimes I heat up the refried beans in a small saucepan before using them but not always. If using only a thin layer of beans on the tortillas the cheese melting stage can be enough to heat them up. 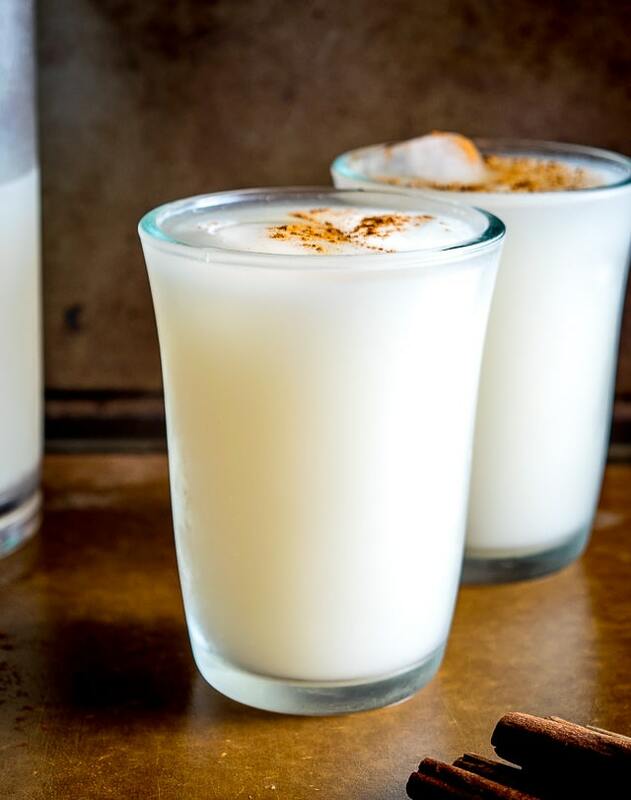 Serve these tacos with a homemade batch of Horchata and it is game over. We also have an express version of Chicken Tacos on the site. Recipe here. OMG! All my husband could say was ‘that was out of this world; that was out of this world’ ; bad news was I couldn’t take any credit for it. It all worked! GREAT recipe. Ha awesome, thanks much for your note Sue — but you can take credit as most peeps won’t spend the time to make everything from scratch like you did! Question: You say to give the cut up chicken a swirl in the seasoning and set aside. I just wanted to confirm that this is raw chicken being swirled then cooked up in the pan later? We are not boiling or baking the chicken prior? Hi Carrie! Yup you got it exactly, I’m just coating the raw chicken in the seasoning and then cooking them up in the pan later. 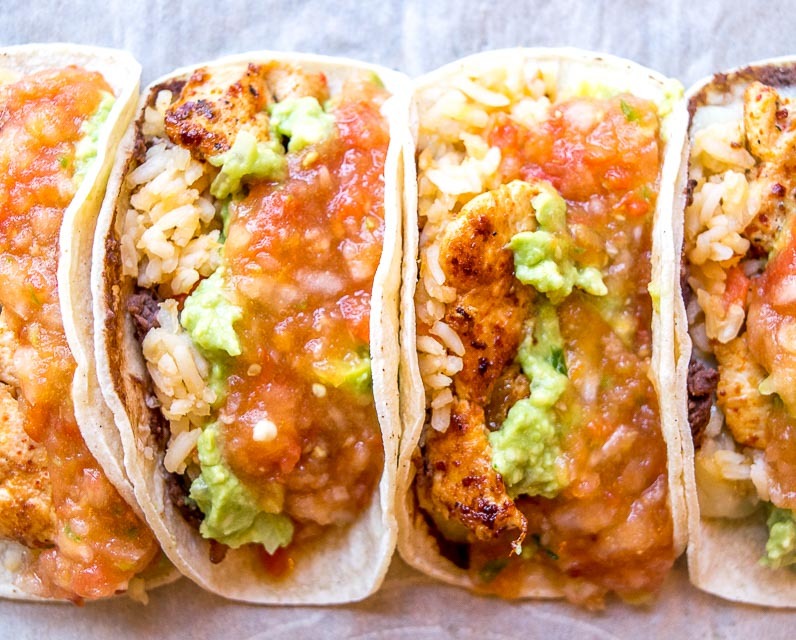 I hope these tacos treat you well they are easily one of my favorite dishes on the site. Cheers. This looks incredibly delicious. Yum! Hi — what kind of cheese do you recommend? Hi Sarah! I usually just stick with Jack or Mozzarella — the Salsa will provide most of the flavor so you can get away with just about any cheese. I was strapped for time and just used the chicken and guacamole recipe. I used hard shell tacos, salsa, sour cream, cilantro, lettuce, tomato and some hot sauce and it turned out delicious. Thank you!! Thanks Lauren! Yeah I do something similar quite often — even just a couple of the elements made from scratch will still give you a great result. Cheers.